The meaning of “Ajinomoto” is the “Essence of Umami,” which has been evolved from its literal meaning the “Essence of Taste”. Combining the infinity symbol with the letter “A” incorporates three ambitions: the investigation, mastery and spread of “taste (Aji)”; the evolution and development of the value of “Amino acids” with leading-edge bioscience and fine chemical technologies; and the promotion of global sustainability. The line flowing from “A” to “j” depicts a person, suggesting people Joined together and taking Joy in the cooking, eating and comfortable lifestyles provided by the taste (Aji) and Amino acids. The line extending from the bottom of "j" upward to the right expresses the growth and development of the Ajinomoto Group into the future. (Disclaimer: right as I finished preparing this post I realized the logo redesign is from one year ago, which is outside of our timeframe criteria but we are super busy with Brand New Conference stuff and I can’t whip up another post this morning — plus, I don’t think many of you keep up with the exciting world of corporate umami so this will be news to you as well). The old logo was a decent Optima-esque wordmark with a custom, infinity-loop “A”. It wasn’t amazing but it had enough flair to be distinctive. The new logo keeps the wordmark, makes it bold, and adds a new “Aj” monogram. The monogram is quite nice, even with the over-rationalization of its elements. However, given that taste translates as “Aji”, I wonder why the monogram doesn’t spell “Aji“? Phonetically I guess it does but more literally, and especially since it’s a global company maybe it could have been clearer. What does bother me about this new logo is that they kept the loop “A” in the wordmark that is the same in concept as the big “A” but has a different construction. It looks sloppy and repetitive. I do like the bolder version of the wordmark and with a normal “A” would have been a great complement to the monogram. On those covers, I don’t know how much of that is the official house style vs. some covers some folks in some office whipped up but I guess they do pay off of the tittle of the “j”. Overall, you do you Ajinomoto. Thanks to Manny for the tip. (Est. 1909) \"Ajinomoto Co., Inc. is a global manufacturer of high-quality seasonings, processed foods, beverages, amino acids, pharmaceuticals, and specialty chemicals. 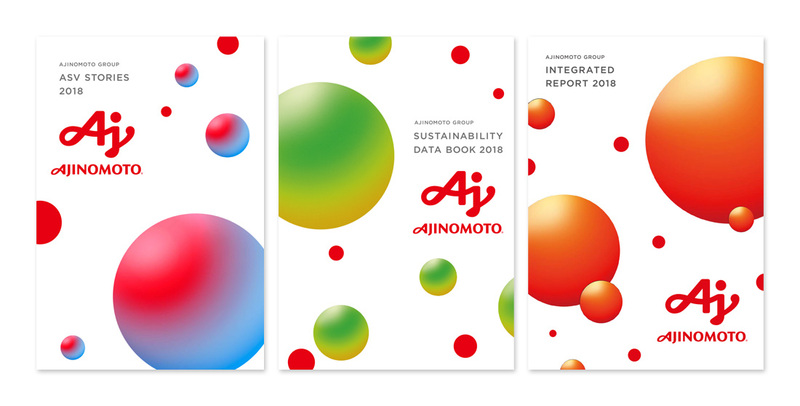 For many decades Ajinomoto Co. has contributed to food culture and human health through wide-ranging application of amino acid technologies. Today, the company is becoming increasingly involved with solutions for improved food resources, human health and global sustainability. Founded in 1909 and now operating in 30 countries and regions, Ajinomoto Co. had net sales of JPY 1,091.1 billion (USD 10.07 billion) in fiscal 2016.\"